Should we freak out about the Falzon stuff? The New England basketball scene got a little controversial Tuesday when worded leaked out that BC was no longer recruiting Aaron Falzon. The problem came when Falzon, his family and his coach found out via Twitter instead of hearing directly from BC. Jim Christian and his staff can not publicly talk about recruits or explain why or how it happened, but through the backchannel rumormill, it is being said they told Falzon first. Yet his family and coach dispute the sequence. The only thing that most observers can agree on is that it wasn't handled well and now Christian has pissed off a local recruit at a regional power (Northfield Mount Hermon). I don't care who Jim Christian recruits. If he thinks Falzon is not a great fit for his system and prefers Markus McDuffie as a power forward, that's fine. Christian -- not me -- has to coach the guys. But the problem comes in perception and execution. Despite not having a great recruiting reputation, Christian said winning in the ACC takes talent. He hired two ace recruiters for his staff. Now before they've even started practicing, there are questions about how this staff is working together and if Christian can close the guys Murphy and Spinelli serve up. Although Christian hasn't thrown Donahue under the bus in publicly, he has made it clear to those close to the program that he has a different recruiting philosophy than our former coach. Falzon -- with his long range for a big man -- might have been the perfect Donahue player. Maybe he would have been lost at BC under Christian. That's fine. The staff certainly did their homework on him. However, they need to get better at communicating to recruits and they better hope that this didn't piss off Josh Sharma and that they close on McDuffie. It wouldn't hurt if McDuffie proves to be a better player than Falzon. When will the SuperFans grads change the BC Fan culture? Despite some issues with basketball and the fairweather nature of any group of fans, BC's has a strong student section for Football. The SuperFans have made supporting BC Football cool for 16 years. However, I don't know if that SuperFan culture has carried over enough to when the SuperFans become Alumni. Now I know the caveats: the Spaz's years dampened enthusiasm, recent grads move out of New England, recent grads are broke, etc. But even students who endured the Spaz years still have enough high points (bowls, GameDay, Luke Kuechly) to grow the attachment referenced in the Michigan piece. I think it is that attachment that is missing from all of the pre-SuperFan Alumni. I know a large portion of loyal, older fans were turned off by the DBS, but I think for decades there was a detachment to BC sports. The Flutie runs or the Coughlin moments had a lightning in the bottle feel but otherwise there was an overriding cynicism to our fanbase. Or at least that I what I felt when I first arrived at BC in the mid-90s. The football games were social and the game was really secondary. So when the diehards were driven away, the casual fans didn't backfill because of the detachment. The oldest SuperFans are creeping towards 40. Even with conflicts like kids or geography, the largest portion of these SuperGrads should still live in the northeast and still have BC in their blood. 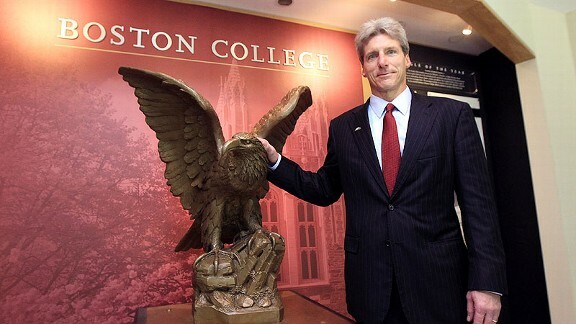 I know that BC keeps creating opportunities for young alums (GOLD). That's good. Now we just need a few more classes to graduate and then maybe we will have enough people that we can finally fill Alumni consistently. Winning wouldn't hurt either. The whole game had a sense of dread. Allowing them to score and then missing our chance to score before the half. Needing an endzone INT to kill one of their drives. Nearly losing the football a few times. It just felt like things could fall apart at anytime. So of course we lost. Watching it back was even worse. We should have won. We didn't play our best yet we still had a lead the majority of the game. As Daz said, we make one stop on 4th and 12 on a short field and it is over. This was tough and how we respond will say more about our coaching staff than it will about our players. The biggest point of discussion on Murphy's play seems to be the INT. He admitted that in the redzone he has to be more careful. But if Callinan doesn't fall over that is probably not an INT. My bigger concern was Murphy's decisions on the the options. There were some big holes that he didn't exploit. The passing game was better. He made some bad throws and some forced throws, but he was also better throwing from the pocket. We are going to live and die with him, so I will accept the mistakes as long as he is winning with big plays. We didn't have enough this week. The running backs as a group were good. Hilliman ran hard and made some big plays. He's still not great in traffic or making guys miss. Willis looked good and probably needs more touches. Outlow's catch was pretty. He probably needs to get more touches. Wofford was fine. The Offensive Line was not great. The holes weren't as big. The push wasn't as strong. And of course things got worse late. Bowen got blown up on the final play. Gallik was the best of the group again. He moved well too. Silberman was better. Kramer was ok.
Bordner is really coming around. He's good in space. His hands are improving and he can start to win the one on one battles. I have no idea why Alston didn't get touches but he needs to be more than a decoy. Dudeck looked really good over the middle. Crimmins was better. As I already pointed out Callinan's fall led to an INT. McClary caught the only pass sent his way. One of the issues in our running game is the Tight Ends. They are not blocking as well as last year's crew did. I am a big fan of the shifting and a big fan of the power/spread combo. We even used a Maryland formation (which has three backs in the I behind Murphy). However all that window dressing doesn't mean anything if the D is not confused. I don't know what Colorado State saw, but they decided not to make too many adjustments to our shifting. They also were patient with our run game. They didn't crash the options over and over and instead waited for us to get frustrated. That is probably what other teams will do now. It is up to Ryan Day to think of new wrinkles. As for this game, I think the offense did enough to win. Two long drives came away scoreless based off of player mistakes, not play calls. As I said with Murphy my biggest issue is that we need more option and more reads with Murphy keeping it. Even when the opponent is giving you something -- like the pass -- you still need to be patient with what works best. We should have had more runs with Murphy. If the Defensive Line played their best game against USC, this was probably their worst. No great push. Not enough big plays and some guys getting pushed around. Statistically Kavalec had the best day, but his tackles weren't important in the scheme of things and he didn't have the great plays like he did against USC. Mihalik was the most disruptive and had a sack, but I felt like he could and should have closed on a few other occasions. Wujciak was good in the first half but didn't get the same push in the second half. Abdesmad is getting pushed around. I don't know if he lost speed or power or both, but the guy is either not 100% physically or not showing the same fight he did last year (before the injury). Moore looked okay and maybe should be getting more snaps. The LBs were not good at all. Daniels had the best game and did make some big plays late, but even he missed some tackles and got burned during coverage breakdowns. Duggan got pushed around. Keyes penetrated a bit -- which makes a difference -- but couldn't close himself. Also, his ability to get past the line seemed to all come in the second quarter. Plus he missed tackles. Strizak wasn't as productive as he was earlier in the season. Despite the other guys making more tackles and INTs, I thought Asprilla was the most consistent Saturday. When he tackled he brought guys down and he had good pass breakups and coverage. Jones made a nice play on his INT but also missed some tackles. Simmons was all over the place. He played well, but also missed too. Williams INT came right to him. Coordinators are easy to pick on. Neither coordinator had a great day, but I feel like Brown's schemes and calls cost us more Saturday. BC couldn't get enough pressure on Grayson and he was rarely confused by the scheme. There offensive line also knew where the breaks were coming. And when they weren't getting picked up, they were getting beat with crossing routes and screens. When they needed a stop at the end, they couldn't get CSU off the field. But plays and schemes can be beaten. Players miss tackles, but the continued confusion in the secondary cannot. That's coaching. The last play was broken and a guy got wide open in the corner. But that wasn't the only example. There were plenty of missed assignments. Brown and his assistants need to clean that up. We've had bad kickers before and still won. There are workarounds, but you just have to be ready and prepare for them. Workaroud No. 1 is the long squibs on kickoffs. The problem there was that the tackling was still only ok. The second workaround is that you cannot take any field goal for granted and are in probable 4-down territory unless it is a chip shot. That miss at the end of the half would have made a difference. From now on Daz needs to press more in the two-minute drill, because a kick is not automatic. Willis was fine on the kick returns. I don't think the blocking is good enough or consistent enough for him to break a big one. They only punted once, so you cannot read too much into that unit. Our punting, however, was very inconsistent. You could rationalize most of last year's losses to tough breaks or falling to a better roster. This wasn't the case. CSU has some nice players, but overall they are not that talented and their staff is still relatively new to their program. This was a case of BC losing a game they should have won. There weren't glaring game management issues to pin on Daz nor did it seem like the initial gameplan was unsound. Where things fell apart were the adjustments. As I wrote above, those adjustment issues fall on the coordinators, but it also falls on Daz. I don't want him micromanaging in-game, but he's also got to take control. It is a fine line, but that is one of the reasons we hired an experienced Head Coach. Ideally he should have that feel now. This wasn't a confidence shaking loss. In fact I still feel good about the season and about Daz. However, we've now been exposed. Every team we face now has an answer for how to deal with our blitzing and to a certain extent how to deal with Murphy. It is up to Daz to get together with his staff and figure out counters to their counters. Daz confirmed he can recruit. We always knew he could do the motivational stuff. The question was always the Xs and Os. I hope he has the answers. I thought the Pitt game would be the one to haunt us. This was worse. There is plenty of blame to go around: terrible special teams, bad tackling and an offense that cannot afford to make mistakes. Daz has a lot to work on and now we've lost our win cushion in the road to bowl eligibility. I'll have second viewing thoughts and grades up late Sunday. This won't provide the highs of USC nor will it generate the "ehhs" of Maine. Instead this game represents a great opportunity for BC to close the month out with a win and prepare for the rest of the ACC slate. Let's make it a good one! Leave your thoughts and comments below. Because this is an ACC game but not the "ACC Game of the Week" the coverage varies from region to region. In New England it is on NESN. In the New York area it is on MSG+ and everywhere else seems to be on a regional Fox affiliate. Ofcourse if you cannot get coverage locally, you can always join your fellow BC fans at a Game Watch. If your local watch is not listed, be sure to post a message in the comments. A few of you emailed me worried that BC and BC's fans are taking Colorado State lightly. I don't see it. Last week was a clear wake up call that BC cannot just go out and beat anyone. And that was against Maine. This is a solid, well-coached CSU team. This is a huge game for them and their conference. If BC doesn't take this game seriously, then they are in for a rude awakening Saturday. I remember how happy I was the last time we played and beat Colorado State. It had been a transition year and at times that season it looked like things might fall apart. However, Paul Peterson took over late in the campaign and BC rode a wave of momentum into the bowl game. At the time I thought maybe TOB could build something or get us to the next level. We know how that ended. Now over ten years later we are watching what Addazio can do during a transitional year. The circumstances are different, but here is Colorado State again. A win might not leave me as happy as the San Fran Bowl did years ago, but it would be another victory for Addazio in a year where many thought wins would be hard to come by. 1. Don't give up the big play in pass defense. I don't miss Spaz's bend but don't break philosophy, but it might be what we need this weekend. CSU will throw it. The key is to keep the guys in front of you and make them go the whole length of the field. 2. Get Alston involved in the passing game. The Jet Sweep is known at this point. But we can add wrinkles -- a screen or a wheel route off the playfake. I don't care, but I think he is our best playmaker. He needs more touches. 3. Avoid the killer turnovers. No turnovers are good, but last week the INT led to Maine's early success on offense. If we make a mistake this week, just do it where it won't cost us a score or allow them to score. Both head coaches were former Offensive Coordinators in the SEC. After dodging a bullet, it will be interesting to see how Florida State comes out against NC State. I am also curious to see how NC State responds to the big stage. They couldn't put away the cupcakes on their schedule. Can they hang with the 'Noles? The Tight Ends involved in the passing game. I don't think it is critical to winning, but a game against CSU is a perfect time to add a new wrinkle. When we do pass to a Tight End, he will be wide open. We need to score on the final drive with only a minute or two left. I am not afraid of deficits and I think we can score fast. But if we have to drive 80 yards in a two minute drill type situation, I don't know if we can win. Our passing game and our kicking game will cost us one game this year. I don't want it to be this one. Though the atmosphere and expectations are different, I think this game will feel and play out a bit like USC. BC will establish the run and get plenty of sacks, while CSU has to pass to catch up. I think we lead throughout but never really put them away. BC posted the highlights of Meter's interview with Jim Christian. He's not especially charismatic, but I think Christian handles himself well in these sorts of things. He has a quiet confidence that reminds me of Skinner. The Heights posted a great Q&A with Chris Herren. The Herren story is well known at this point, but when he shares the BC portion of his saga, he still tends to just note his injury and failed drugs tests. This interview goes a little deeper and gets more specific about his time at the Heights. Good job by the interviewer Connor Mellas. It is interesting how younger BC folks view Herren. His legend has grown in part due to his struggles and his recovery in the spotlight. As someone who started at BC at the same time, Herren was always a "what could have been" to me. But he flamed out and was an afterthought during the final good JOB years. Former BC Basketball assistant Bonzie Colson decided to get back into coaching at New Bedford High School. I actually applaud Colson for not using his son Bonzie II to get a college job. He probably could have packaged himself with Bonzie II at some mid-major. Instead Bonzie II is freshman at Notre Dame while his dad is back working high school games. BCI uncovered New Mexico State still listing BC as one of their 2015 opponents. I still have my doubts that it happens. I just think NM State would rather buy us out than give up paydates at Florida and Ole Miss. BC leads a weird note on Ivan Maisel's "Three Point Stance." 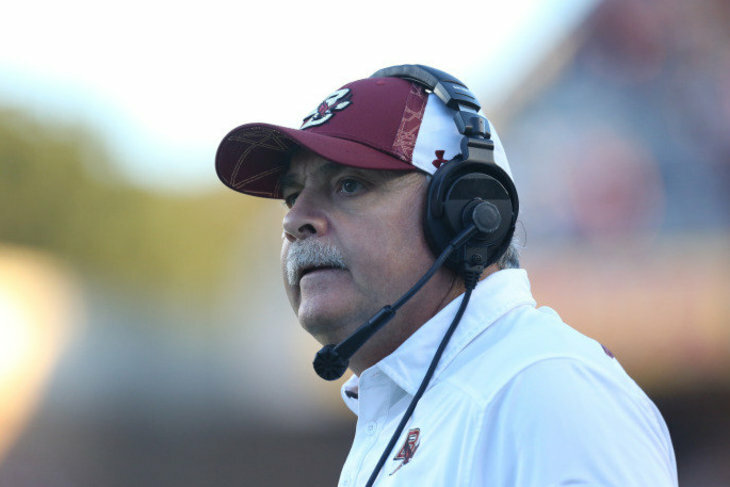 I don't think anyone is surprised by BC's struggles in the passing game, least of all Addazio. I think Daz just wants improvement. Is Brad Bates Michigan enough for Michigan? Michigan created a PR nightmare when they announced and then denied a ticket promotion with Coke. But people tend to overlook promotions and tickets don't need discounts when you are winning. That is the bigger problem in Ann Arbor. It would seem that Brady Hoke is in trouble, but the fans and critics who see the big picture want an AD change first. If Michigan makes a change in their Athletic Department, plenty of names will be floated, including BC's Brad Bates. I was thinking about Bates and Michigan during the Utah blowout. This article on the topic (HT EO) seems like spitballing more than reporting, but you don't need a source to know that Michigan is going to look for replacements among their own alumni. All colleges have their own myopic and self-centered culture, but Michigan is one of the most closed off. Their iconic coach Bo Schembechler instilled this philosophy when he said "Michigan man is going to coach Michigan." Ever since then they've been looking for their Michigan Men. Sometimes it works (see Red Berenson) and sometimes it doesn't (see Brady Hoke). If you're an outsider, the culture can work against you (see RichRod). If they decide they need a Michigan Man to clean things up, Brad Bates is going to be on the short list. Will it happen? Would Bates want to return to his Alma Mater? I don't know and really I don't care. I think Bates is fine, but I never expected him to have a long tenure. As with so many sports hires, you get someone who was different from the previous coach or director. Gene was a long-time BC employee who left his fingerprints on everything. It would only be natural that his successor would only be at BC a short time. Bates already accomplished enough in my opinion, to leave on good terms. His tenure confirmed that there is life after Gene and he made what seems to be a good football hire. The ACC is more stable now too (regardless of what Bates did or didn't do on BC's behalf). There is still plenty left to do and plenty to still asses, but I would have no problems if Bates went to Michigan. There are plenty of BC guys who would love to take his spot. This Sunday is the Kevin Eidt Memorial Scholarship Golf Tournament at the Wayland Country Club. The proceeds go to support an CSOM Honor Program scholarship in Kevin's name and a annual award to BC's Emerging Leaders Program. The Fund has awarded over $270,000 in scholarship money to BC since 1999. In addition to the usual golf fare and regular registration the event has an auction which includes a BC/Clemson middle campus parking pass, tickets the the BC-UNC basketball game, a Lower Brighton pass for the last three games of the season, and a pass for four to attend a live broadcast of NBC’s Sunday Night Football Studio show in Stamford CT in October. For more information to the memorial website or email Kevin's brother. After struggling this season, the Lions cut Nate Freese. I am surprised with his struggles considering his accuracy last year. I am sure he will get a second shot at the NFL. BC Hockey begins the season ranked No. 2 in the Hockey East preseason poll. Soaring to Glory took a deep dive on the evolution of our run game under Addazio. I apologize for the delay in reviewing the game. In a way it wasn't really a second viewing yet wasn't a first time viewing. My ESPN3 was really delayed and out of sync Saturday. I would see an update on the blog or twitter and then see it unfold in the game a few minutes later. It has a bit of a numbing effect. Like when Murphy threw the INT, I couldn't believe it. But 30 seconds or so later when I finally saw it, I was able to process it and watch it in a different manner. I was less angry but more anxious that the game would slip away. Fortunately things settled down and BC took control. In the other games I blamed the passing issues on the Wide Receivers more than Murphy. I cannot do that this week. Even when he's not rushed or under pressure some of his passes and decisions are off...like the INT. I think getting him moving is a solution though since it might get him thinking less about mechanics and fundamentals and just getting the ball to the receiver in a catchable spot. The first TD was once again a matter of him making one guy miss and then taking off. He made good reads on the zone reads all day. I was glad Wade got some playing time. Given the circumstances I don't know if you can read much more into it than what we saw with the Spring Game, but his passing motion looked a little tighter. Welcome to the party, Marcus Outlow! But like Wade, I don't know if we can read as much into his numbers since it was in the second half and while the game was out of reach. I did like getting him involved in the passing game. We need more of that with all the RBs. Hilliman was good. Willis is getting the touches but not the explosive plays. I think he is close to breaking one though. Wolford got a catch. He can be a bigger factor in the passing game if we do more play action. Alston is considered a WR, but considering how we use him on the jet sweep, it is almost like he's a running back. I would love to see a play fake on the sweep and then a deep pass to him on a wheel route. I am impressed by Bordner's ability to weave and catch the ball in traffic off the shovel pass. He also had a nice run after the catch on the TD. Despite the early drops I think the transition to WR is going well. Dudeck finally got some balls his way. He's not explosive or a big blocker, but at least he's sure handed. The OLine was good. Our early sluggish issues were not upfront. The Vardaro injury is what you fear in a game like this, but I assume he'll be back shortly. I thought Gallik had another solid game. Rarely do our breakdowns occur in his area. I felt Day called a good game. There was no new wrinkles and nothing exotic. Our early issues were more about execution than trying to get too cute against Maine. When we needed to take control in the score and the tempo, he went to our bread and butter plays. There was some chirping on the message boards and twitter that we should have passed more, but together we passed more than 20 times in a blowout. I still don't know if he has a good feel for how to use Murphy's arm, but they are getting there. I thought the Defensive Line was the most consistent unit of the D. They were ready from the start and didn't make many mistakes. They got good push and stopped the run. Wujciak dominated his matchups. Moore did well. Mihalik was fine. I don't what happened during the Pitt game, but Keyes has been much better since. He was active and better tackling. Duggan played well in his return. I was glad to see Strachan get extended time. He looked good. Johnson got more time than usual and made the most of it. Asprilla was fine early.Williams was good. Jones was ok.
Like the offensive scheme, the defense was hardly exotic. We didn't dial up nearly as many looks and blitzes as normal. After Maine's early success and big play, they showed Brown talking to the guys on the sideline. Obviously I don't know what he said, but he wasn't going nuts. Perhaps the calm helped and guys just did their respective jobs. As the game wore on we forced more short series without doing much. The B- is really due to allowing a guy to get that open that early in the game, but other than that and few penalties, it was a solid performance. The kick coverage was just okay. It wasn't as if a bunch of tackles were missed or we had breakdowns like the USC game. But the returns all went a little longer than I would have hoped. I don't know if it is an airtime issue. It is hard to tell from the stream. The punts were fine. Willis looked strong on our returns. I think he will break one soon as he's getting good speed and making the first guy miss. A bit better blocking and he'll make more miss. Alston didn't get to do much on the punt returns. The PAT issues continue. I think this is all an after effect of having two kickers (yanks, low kicks, etc). Howell was fine on the FGs. The biggest takeaway is the win. Did the team come out fired up? No. Did we work out the kinks in the passing game? No. Did the defense avoid mental mistakes? No. But none of that really matters. These games vs FCS teams are pretty useless. Avoid enough mistakes to win. Addazio kept his cool and kept it vanilla on both sides of the ball and that was enough. He also got some extended playing time for the second teamers. Now the key is to turn the sloppy play into a solid week of prep for Colorado State. Sorry for the delay. It won't get posted Sunday night. I will have it up Monday morning. It was almost cliche watching BC make a few mistakes that allowed Maine to hang around into the second quarter. Fortunately we finally established the run and the defense tightened up and BC ran away with the game 40-10. At this point I am just glad our young team picked up another win. This will give the coaches plenty to focus on. Don't take this game lightly! Maine beat a FBS team last year (ok, it was only UMass). But this will be a good test for our team's focus and maturity. Are they ready to compete every week? Can they handle the comedown off of the USC win? Let's hope so. Leave your thoughts and comments on the game below. With the welcome news that BC will not use the Red Bandana uniforms again this season, the BC Twitterers and BC blogosphere went into overdrive about BC's current and future uniforms. Brian recapped the cross talk and outlined a basic plan I agree with, however, he didn't spend as much time on the "fashion don'ts" as I would have liked. Because if there is one person that BC should be taking fashion tips from, it is a blogger dad in his late 30s who wears about three different things and doesn't have to talk to recruits. It is not even an after Labor Day rule. There is no historical justification for it and I closely associate it with the Gene DeFilippo era. Except for a designated special uniform day, our home pants should always be gold. No exception. On the road, I prefer the gold pants for historic reasons, but will accept the maroon pants (see Rule No. 3). I am okay with the stained glass effect (on a maroon stripe). I liked the wounded warrior helmets. I thought the red bandana helmets were appropriately subtle. I don't mind a solid gold helmet as a throwback. But all variations to the BC helmet should be under clearly defined specialty days. No random usage of the white stripe a.k.a. the 49ers helmet. One could argue about the fun or early victories associated with the white pants. But the white stripe will always scream Spaz football to me. Do we want that kind of association? I know the history of the maroon stripe is not that old, but it is clean, classic and closely associated with BC Football. Embrace it and use it in most of our games. My preference for all BC road games is a white jersey and gold pants. I can live with maroon pants. I never want to see the white pants again. But whatever BC does, I just want consistency. Pick a road uniform combo and stick with it for multiple seasons. When people flip on the channel, they should see the uniform and think "that's BC." Use the home games for the gimmicks. On the road you set a tone for the opponents and opposing fans. Establish a look and then go win a bunch of road games. It will be hard to match last week's excitement, but hanging with a few BC friends always makes a game more fun. Here are the regional Game Watches. If your Chapter's is not listed, post the information in the comments section. This is probably the perfect opponent to follow USC. Even with Mr. Motivation as Head Coach, a comedown is only natural. But if the team starts slow, we have enough talent and size that controlling this game should not be an issue. Like every FCS matchup, you just hope for a nice win and to avoid any injuries or issues. The Boston City Council keeps moving forward with their new rules for college athletics. Because Marty Walsh has yet to see the Bill, this is all still grandstanding, but at what point does BC need to get involved to curtail this nonsense? Exploitation and college athletics go hand in hand and that needs to change. However, these local legislators don't have a clue and are not the ones to fix it. I hope it doesn't go much further because then BC and any team we play in Boston will be impacted. 1. Win without trying anything unique. There are plenty of twists BC can use in our offense, especially now that every team will key on the run. Don't use any of those this week. Just beat Maine with a simple vanilla package. 2. Work out the kinks in the kicking game. I don't want to settle for field goals, but I do hope that whoever is kicking PATs and FGs starts making them. 3. Take control early. Think of how Villanova surprised BC last year or how the drives against UMass stalled out this year. That shouldn't happen this week. BC needs to set the tone early and control throughout. The is no point spread on the major betting sites. The first three games of the series were played in Maine. Since then all the games have been played in Chestnut Hill. Even before the Winston half-game suspension, the FSU-Clemson showdown was critical to our division. How the 'Noles play without Winston will be a decent barometer of how good they are and how good Clemson is. The backup Offensive Line play for long stretches. Not only will this mean BC is in control of the game, it will also be a chance for BC to test next year's starters in live game conditions. Murphy gets hurt. I don't think losing Murphy would mean we lose the game, but it would be disastrous for the remainder of the season. There is always a risk to taking an opponent lightly (just ask USC). But I don't see it this week. It would be one thing if this were even a great Maine team, but this is a Black Bear squad coming off a loss. I think like the UMass game, BC's lines should dominate enough that the contest is never really in doubt. Maybe Maine gets a late garbage TD, but otherwise it is BC all day. I think it is time to appreciate Alumni Stadium for what it is: the surprising House of Horrors for visiting college football teams. It happened again Saturday night when USC players kept mentioning the stadium in their post-game comments. In this Oral History of the 2001 Miami Hurricanes, the greatest team in college football history admits that there is something flukey about playing at Alumni. Davenport: It's cold, I don't know if it's the Boston chowder that we eat at the hotel, but we're always just sluggish when we come out. Randy Shannon (defensive coordinator): It was just ... Boston. Even when I (coached) with Dennis Erickson, it was always the same. For some rhyme or reason, we couldn't figure it out. Coker: What I really think it was, was perception. We didn't perceive Boston College as being a Florida State or Florida or Penn State or one of those types of schools. Right or wrong, that was the perception. Curtis Johnson: You never stay near the stadium. The bus ride in, it looks like -- this isn't a knock on their stadium, because it's a great stadium -- but it doesn't appear what you would expect it to be as far as a major college football stadium. It's not like you're going into Florida State. You just don't see it as being, that kind of stadium. All the key ingredients are there. Teams don't take us seriously. The setting and environment are different from other venues. The weather can be an issue too. Obviously the better BC is, the tougher the game at Alumni can be, but even when we are not as good, something about the Stadium can make a difference. A few of my pet theories are the proximity of the stands to the benches. In other stadiums the team benches are sometimes 20 yards away and 12 feet down from the nearest seat. At Alumni, the benches are closer to five yards away and fans can lean over the railings and practically touch players. If a favored team is frustrated, I am sure the tension is ratcheted up with BC fans breathing down your neck. Then there is impact Alumni's design has on the opponents. We know Alumni is closed on both ends with a low upperdeck. This can make the 44,500 seats feel much closer than they actually are. The all aluminum seating also creates louder than expected noise. In the Miami article TOB champions the weather issue as well. Depending on the opponent and the time of year, New England weather can be a factor in any game at Alumni. Traditionally our September games can be surprisingly hot, our October games are often wet and November games are cold. Sure our players also have to deal with the elements, but when you're on the road and in a dogfight, bad weather doesn't raise spirits. The USC players talked about the travel. Obviously that is another issue that varies by opponent, but being a long trip never hurts our cause as the home team. To ever get a national homefield reputation like Blacksburg or Boise, we will need to rattle off some long home win streaks or upset a bunch of ranked teams. But until then, I am happy that our little stadium keeps surprising our opponents. Brad Bates used his latest "Letter from the AD's Desk" to sell people on coming to the final five home games. It is not a bad idea. Everyone's in a great mood about BC sports and the word of mouth from those who attended the game was great. Not every game will be as special and I think there are many factors in a home attendance issues, but a big one that has been overcome is our competitiveness. BC no longer has a sad sack as coach, so I think some of our fans can start to get excited about the games instead of feeling like they are wasting their time. Bates's focus was on the memories of Saturday night, but his office did add a new face this week. Bates hired Marcus Blossom as Associate Athletics Director for Business and Administration. On the surface this is not a major hire, but it is important for Bates. Even two years into his tenure many of the Athletic Department staff are holdovers. Bates did not clean house when he took over. The fact that so many stayed speaks to Bates' ability to win them over but also their love for working at BC. I expect we will finally see some top-level changes once Bates announces the Master Plan. The story of Henry Hill fixing BC Basketball games will lead off the latest series of 30 for 30 films. Brian St. Pierre St. John's team is off to a good start. Here are the Game Notes and Depth Chart for the Maine Game. This article on Barry Gallup's role within BC Football is from last week, but still worth your time to read. This is awesome and I could watch it all day. Addazio does a great job of building to his point and handing it off to the Crowthers. From there Mr. and Mrs. Crowther are charming, sincere and touching as always. They've handled themselves with such class since the moment they were thrust into the spotlight. It was the perfect ending to a week of honor and remembrance of their son. My concern is news that BC will incorporate the Red Bandanna motif into their uniforms for the remainder of the season. We don't know how or to what extent, but the whole thing gives me pause (like Brian). Welles deserves honor and celebration. Saturday night was perfect. However, if you do something all the time, it makes things less special. And I worry that it also becomes a little exploitative and commercial. Will some on the team be inspired each time they see the Red Bandanna? Of course. But others might start to take it for granted. I had the similar concerns about exploitation and people missing the point during the Ice Bucket Challenge. And I was probably wrong then. Whatever fears I had of people's motivations, clearly the good aspects of the Challenge far exceeded any social media narcissism that took place. Maybe I am wrong here. Maybe incorporating the Red Bandanna into the uniforms will be done with subtlety and respect. Or maybe I shouldn't worry, because the Crowthers have handled this whole process so well, I am sure they would let BC know when things didn't feel right. Gimmick offenses or offenses that can't run and pass don't win championships (see Georgia Tech or Mike Leach's various iterations). However, a unique offense can help a limited team win way above its talent level (like Navy seems to do). Longterm, Addazio talks of mixing Stanford's power with Urban Meyer's spread. How and when he gets there with his recruiting and scheme is unknown. But for now we are a nearly run only team and it definitely has its advantages. Last year Addazio played to his roster and his strengths. He was not shy about giving Andre Williams the ball and sending him out there behind six offensive linemen and two tight ends. Predictably whenever BC lined up like that the other team would crowd the box to stop Andre. With a crowded box BC would see plenty of Williams' runs that resulted in no gains. However, once or twice a game Williams would break free and take off for a huge gain. While BC experimented a bit in the first two games with formations and featured runners, it is now clear we are still at our best going big and our best runner is Tyler Murphy. And Saturday night we saw the return of my favorite type of play -- the big run when the other team crowds the box. Take a look at this GIF from Bostinno. USC has nine guys close to the line and only their corners playing off. BC blocks well, two guys bite on the hand off to Hilliman, Murphy makes one guy miss and he's gone. Game over. This is not ideal and some teams will adjust. But for now, playing a gimmick offense is BC's best way to be competitive. Addazio wants explosive plays but we only have a few explosive players. Giving them good blocking and one guy to beat will be explosive and fun to watch. Watching the game live was tense. It constantly felt like USC might light up the scoreboard with a big play. The second time around you realize how dominant this performance was. The final score doesn't even indicate how BC controlled the game from the 2nd quarter to the finish. There was a lot to like about the whole performance. As I tweeted, Tyler Murphy didn't complete a pass in the second half, yet BC extended our lead. He really didn't need to throw much. USC couldn't stop him and he made great decisions on the zone reads and options. His passes in general were more crisp although still not great. I also liked that he was quick to run when his first passing reads weren't there. He had some wide open players that he ignored but I think that will improve with film study. Overall though, this was the Murphy we needed: run first and keep the threat of the pass in his backpocket. There had been some talk about Willis and Rouse's decline after the Pitt game. I think this game reinforced that both are still good and just needed better blocking. Hilliman made the most of his first extended time. The announcers talked up his potential as the big back, but he was more than just that. He showed great speed on the TDs and enough instinct to reach for the pylon. Wofford blocked well and it was noted by Blackledge. The WRs were bad again as a group. While their opportunities continue to decrease, they are not helping themselves with the continued drops. Bordner, Crimmins, Alston and Callinan are dropped or missed catchable balls. But it wasn't all bad. Alston proved to be a real threat with the ball. He's listed as a WR, but I think he's going to be like our version of Percy Harvin and will probably get more handoffs than passes this year. Bordner blocked really well. The Offensive Line played very well. Gallik led the way and other than a mix up on a late coming rusher, had a pretty steady night. He looked very good moving too. Kramer played well and had no big issues. The pass protection was much better. Silberman didn't look as lost and didn't have any noticeable issues. I thought the play calling was very good. What I appreciated most is that many of the plays built off of previous ones. For example the option...and then they option with the end around to Alston...and then the fake end around to Alston. We also incorporated the dive into our zone reads, which is a wrinkle I haven't seen before (the Dive is more a staple of Navy and Georgia Tech). I would still like to see Murphy roll or bootleg more, but after last week's disaster in passing, this week was good. Day planned the game well and called it even better. Kavalec had another solid game. He can shed blockers and is a solid tackler. Although he wasn't credited with a tackle, I thought Wujciak did a good job penetrating and disrupting their run game. I didn't think Mihalik played as well. He got pushed around a bit and lost contain a few times. On the other End Moore seemed to get blocked down too. Landry looked good and remains very active. Adebayo had a nice play. Gutapfel looked good. Daniels made plenty of tackles, but I think he was responsible for a few different USC RBs coming out of the backfield uncovered. I cannot be sure but looking back he seems like the fall guy (I don't think Brown would ask the DEs to wait and cover). Keyes looked much better than last week. I don't know why the tackling was so different but he was like a new player. Of the young guys, Lezzer looked good and so did Strizak. As a group I thought the DBs played well. They made most of their tackles, were very active and played well in coverage. Asprilla had one of his better games. He was good in one on one coverage and made plenty of tackles in support of the run. Bryce Jones also had a good game. Milano was a nice surprise and a sure tackler. Sylvia made a mistake in Special Teams (see below) but was solid otherwise. We gave up 317 passing yards but it didn't feel like that and I assume that was by design. Brown left Kessler confused and exploited many of USC's blocking issues. Most of the passing yards came in short passes where we gave the Trojans space. It was a mix of bend but don't break and pressure. Brown did a good job of mixing things up and was able to generate a lot of the pressure with only four rushers. But the tackling improved and so did the run D and for that Brown deserves credit. The missed PAT and missed FG didn't matter but should be a concern to coaches (and fans). Howell's punts were nice and the punt coverage was good. The kick coverage wasn't as good. Sylvia got out of his lane on their big return. However, the squibs worked well and our coverage improved with it. Willis was solid on his kick returns. Alston made good decisions on his punt returns. The hands team didn't have to do much, but at least they were ready and didn't screw it up. This was not a perfect game, but I will ignore that because of the momentous win. Beating USC is nice, but the biggest reason for recognizing Addazio is the difference between last week and this one. BC corrected most of their major errors and regrouped after a frustrating loss. That is a sign of a good coach and a good staff. I know I am oversimplifying again but the core result is clear. This coach and staff have the attention and belief of their players and are making them better each week. As for game management, I am glad Addazio pushed for scoring late in the first half. It made the difference. The kick on 3rd down was a little funky, but as he explained to Holly Rowe, they were trying to see if they could catch USC off guard and 19 seconds wasn't enough to do much. You'd like things to be a little more crisp in those situations, but the fact Addazio has an aggressive mindset is important. When we were nursing the lead, I also thought he used his second half timeouts well. Saving them is ideal, but making sure that we don't make killer mistakes is more important. Addazio always seems to be riding a fine line with expectations. This win raised them. I am not worried about how we handle Maine next week, but the rest of the schedule will be tough. He passed the regrouping challenge. Now he needs to get this team to execute every week. Football wasn't the only BC sport with big news on Saturday. A.J. Turner -- one of the elite players in New England -- committed to BC and Jim Christian. Turner plays for New Hampton but is originally from Michigan. The 6'6 wing's ranking varies by each recruiting service, but all have him among their top 150 players. He also holds offers from Michigan State, Stanford and Florida State. 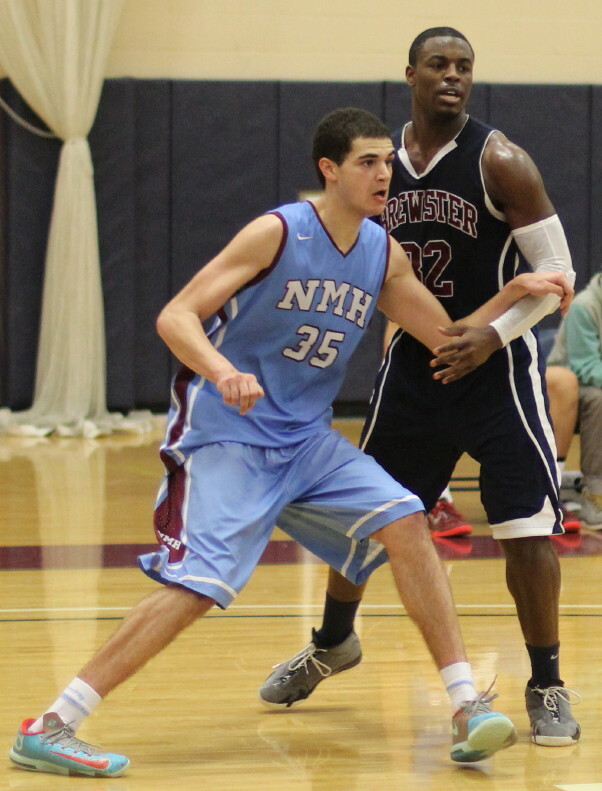 Christian now has a good mix of guards and perimeter players in his 2015 class. The focus now turns to inside players and big men to fill out the recruiting class. When I wrote about what BC needed to do in order to get back in a bowl, I said we had to steal a game from one of the big boys on our schedule. We didn't steal anything Saturday night. We beat USC by overpowering them and running the ball down their throat. Steve Addazio and his staff did a great job in their first year adjusting to the roster they inherited. This season's roster is a mix of young kids and some surprising transfers and they just beat a Top 10 team at Alumni. Calling the win huge would be an understatement. Right now it is clearly Addazio's signature win and hopefully the first of many. There is still a long season ahead and this team still has clear limitations, but this win does two things. It gives the players confidence and it gives the staff a blueprint of how they can play with any team in the country. BC Football is fun again and playing to win makes all the difference. I will have my grades and second viewing thoughts up late Sunday and maybe another post before celebrating the game and the win. The oddsmakers don't like our chances and last year's game wasn't fun. But under the lights at Alumni could mean a whole different vibe. Let's make it a good one. Leave your thoughts and comments below. 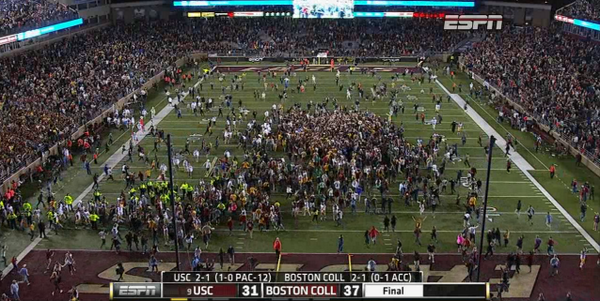 After playing Boston College on Saturday, #USC draws a bye next week. BC draws Maine, which is almost the same. "Welcome to Friday night ACC on ESPN, where we will never talk about the actual game happening unless contractually forced to." It is Saturday night. BC's on national TV. We're playing USC? You know you're watching. Might as well watch with some BC fans! Things don't get easier this week. Prior to the season, no one expected BC to pull off this upset. Any stragglers on the BC bandwagon probably got off after last week's loss. Because of the brand of our opponent and their ranking, the game remains important, but it is not the measuring stick that the Pitt game was. That is why I hope BC comes out trying everything. They have nothing to lose and that is often the best time to win. What's on my mind (not totally related to this game) I already covered the fund raising reminder in BC Magazine, but didn't mention the feature article on Addazio. Because it is coming from BC's official arm, I always find these sorts of articles intriguing for what they do and don't write. It surprised me a bit to read Addazio talk about getting fired at Notre Dame despite graduating 100% of their players. It was one of those typical college coach lines about priorities and the realities of the job. I didn't think it was whiny but it was the first time I recall Addazio complaining about the decision. Addazio has been very good about embracing BC for what it is and not complaining via backchannels about what it isn't. He's only human, but I hope he keeps the attitude and positivity and doesn't start whining about how college football isn't fair. At BC you have to graduate players and win. That's not too much to ask. 1. Someone other than Murphy needs to have a great game. Even if he had played better last week, Murphy cannot carry the team by himself. He needs another playmaker to have explosive plays and score touchdowns. 2. Better tackling. Last week was some of the worse tackling I've seen from a BC team in about ten years. That cannot happen again. 3. Disrupt Kessler. He was nearly perfect against us last year. We've got to give him different looks this year. Some pressure would be nice too. USC and Stanford are the only Pac 12 schools to play at Alumni. I will be paying attention to East Carolina vs Virginia Tech. The Hokies impressed me by winning at Ohio State. But Beamer's teams have a habit of losing focus against teams they should beat. If they come out and thrash ECU, it might be a sign that this Hokie team is different. Passes to the Running Backs. We hardly did it with Andre Williams, but it was a staple of the various offenses we are borrowing from (Oregon, Florida). In theory they are high percentage and it will be a good way to get Murphy's confidence up and will give some of our playmakers -- like Willis -- some space to make plays. We continue to drop passes. Murphy took most of the heat for the Pitt loss, but those drops were as bad, if not worse. I know Addazio will have a quick hook on the older guys who make mistakes. I have no problem with that. Let the young guys play, especially if they can catch. This is preview is probably more heart than head, but I believe we can win. I think USC will take us lightly and will get more fight than they ever expected. I think even 3/4ths full, Alumni can be a tough place to play. I think we work out some of the kinks on offense and put up enough points to hold off a USC team that gets more field goals than touchdowns. BC tweeted out a sneak preview of the Red Bandanna themed uniforms and gear the team will wear during the USC game. I am always leery of how BC incorporates Crowther's signature and story into the sports team, but I do think this looks cool. I haven't talked or emailed the Crowther family on this, but I assume they gave their blessing. I know players and Under Armour love doing this. Let's hope they remain reverent about the source and inspiration for the Red Bandanna. I know it seems like BC Sports is always at a turning point, but I think it is true with regards to fundraising. If you don't believe me, you just need to look at the full page breakdown in the latest issue of BC Magazine. In the graphic BC shows our rank among ACC schools in Annual Athletic Gifts and Total Donors and then shows the corresponding ranking in the Learfield Directors Cups given to the school with the most overall successful Athletic Department (implying there is a strong correlation). 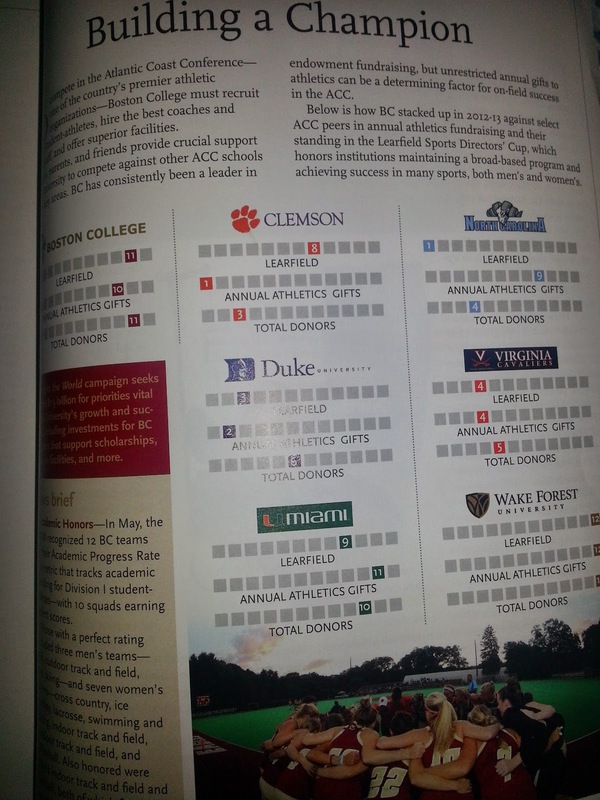 This ranking was done before the most recent ACC expansion, so BC is listed as 10th in Annual Gifts and 11th in Total Donors and 11th in the Learfield Cup. North Carolina was first among ACC schools in the Cup ranking but only 9th in Gifts and 4th in Donors. Wake was 12th in all categories. You can argue over the correlation between giving and on field success, but it doesn't matter what we think or what the statistics prove. What matters is that the people in the Athletic Department and the Development Office think there is a strong correlation. And BC's ability to raise funds for sports is going to determine what sort of facilities we have and how many sports we support. The Master Plan was supposed to have been released last year. It is done but not being widely shared. The reason is fund raising. BC and Bates need to raise enough money for certain aspects of the Plan to make the whole campaign viable. They cannot announce "here is our plan" and then raise a fraction of its cost. Not only would the projects fail, but BC would be crushed by our competitors on the recruiting trail. But the fact that it has taken this long to raise enough money during a quiet period is not a good sign. Bates and his team need to get this project further along. The type of funds you need to support a Master Plan are not going to come from a one-page ad in BC Magazine. Big gifts (six and seven figures) are solicited over months and in face-to-face meetings. But the magazine does set the narrative to the wider community. BC wants to step up its sports giving and if we don't we will suffer on the field. I don't give to the Flynn Fund and no one from BC has shared the Master Plan with me directly. I support the project but will continue to direct my small gift to the BC Fund and let the school decide how to use the money. I have faith that BC Sports will come through and ultimately build the Master Plan. That will save football, but I wonder about all the other non-revenue sports. If we want baseball or want to relaunch Lacrosse, many donors will have to step up in a significant way. BC knows this and that is why they are using valuable communication space to send that message. UPDATE: Of course BC doesn't have the graphic online at the Magazine site. Here is a picture I took with my phone. Football agreed to a two-game series with Northern Illinois. BC will host next year and the return date is still to be determined, but likely in 2017. Playing a MAC school is always tricky because winning gets you nothing but the risk of losing is real. I don't mind the NIU matchup. We should beat them both years. We needed a game for next year and if we ever play the return date, the Chicagoland area is not a bad place to visit for recruiting and Alumni purposes. The reason I say "if" on the return is that future schedules mean less and less. Look at what happened with our Army games or Ohio State games. Every conference mandate has a ripple effect. I don't know if we will even need Northern Illinois in two years. All we can count on is the 2015 game. Jim Christian added a second player to his 2015 recruiting class. North Carolina point guard Jerome Robinson committed Tuesday. Robinson is not an elite prospect, but he is a late bloomer and shows good promise. With two guys on board, there is probably room for two more true freshmen and then a few transfers. BC will honor Welles Crowther this weekend. I don't know if it will inspire the team or overcome USC (like the writer hopes) but it is the right thing to do. BC announced that the Maine game will start at 1 p.m. This should come as no surprise since our ESPN3 games seem to default to that time. From what I gather, it works well for tailgating and gives ESPN a bit of a content stager in their ESPN3 offerings. Florida shooting guard Matt Milon committed to Jim Christian over the weekend. This might seem like a back-handed compliment, but Milon seems more like a Donahue recruit in that he's a shooter and a wing player and a middle of the pack recruit. But is a nice piece and will hopefully build some momentum for the 2015 class. The Golf team won the CCSU Blue Devils Fall Invitational. There are plenty of people bailing on Murphy after the game. I'm not. He wasn't great but he was also our best offensive player. Outside of the obvious mistakes, the biggest issue that I noticed the second time around were the mistakes near the line (on Offense and Defense). I think this game will haunt us late in the season, because it was winnable with better play. Murphy's passes weren't great (but I will get into some of the passing game issues with the other position) but that is not what concerned me. I was more frustrated by his hesitancy in the pocket. He can run on anyone. If the passes aren't there I want him taking off ASAP. Don't pump or wait in the pocket. His runs were good. I wish he had kept it more on the options since he had space. The running backs weren't productive, but I think much of that was due to Pitt focusing on stopping it. Willis was contained. Hillman was ok. Rouse was fine but he struggled in pass protection. I wish Wofford had got his knee in on the pass. The Offensive line was good early, but then started getting pushed around a bit. Gillik was the best. Kramer was good again. Silberman struggled the most of the starters. No one did a great job getting to the second level. But watching it back showed that a lot of the breakdowns on pass protection came from the Tight Ends and RBs. We knew WRs were going to be an issue, but things were bad. Crimmins had way too many drops. If he catches even three of the six he missed (including the INT) it is a different game. Bordner needs to adjust a bit better to balls in the air. Phillips was good. I want to get Alston more touches. I am giving Day a bit of a pass on play calling. Now that he's seen what works and doesn't with Murphy, maybe he will simplify the schemes. My biggest gripe is that we didn't do more running (what he does well) and we did too much passing (things he and the WRs struggle with). You need to do enough to keep them honest and try to get points, but too often, we looked rushed and uneasy throwing. Do more of the bootlegs or give Murphy a moving pocket. It will make the difference. Day also needs to figure out how to get the run game going. Still no explosive plays. As a group, the defensive line had the biggest drop off from Week 1 to Week 2. They didn't get enough pressure or control the line or make tackles. But it wasn't all bad. I thought Kavalec looked really good. He held his own on the line and didn't miss tackles. Gutapfel and Wujciak had a few moments and then at other times really got pushed around. Mihalik was fine. Landry looked good late. Abdesmad looked like a shell of himself. I doubt he is 100% and most of his tackles were after getting pushed well off the line. The praise heaped on Josh Keyes might have been the ultimate jinx. Not only did he miss that easy sack, but he was terrible the rest of the night. He couldn't shed blockers and missed multiple tackles. I am hoping it was just an off night. The Silver Lining of the LB corps was Strizak. He was solid in his tackling and also cut through traffic well to close on the targets. Daniels was fine and his INT was nice. Duggan missed a few tackles before getting hurt. The DBs were not terrible but they were also not great. On one play they would look decent and then outclassed on the next play. Asprilla seemed to make the fewest mistakes. Simmons was really active but missed some too. Simmons wasn't great in pass coverage. Jones got totally faked out on a big pass. Brown seemed fine. Tackling was the biggest issue, but I still put a lot of this on Don Brown's schemes. Why not do more to stop the run? Let Voytik beat you through the air! Voytik made a few plays but he was also very wild and made some really clunky throws. We showed him a lot of different looks but it never became an issue because of how well Pitt ran the ball. Willis did a nice job with his Kick returns. He's finding the space that he's not finding in his regular touches. I didn't love the young guys letting punts roll, but they started catching them as the game progressed. Howell's punts and kickoffs were good. Missing another FG hurt. Hopefully he becomes more dependable on that front. After the game Addazio mentioned the tackling and the missed passes. He wasn't throwing his players under the bus like some former BC coaches we know. But he was doing the knee-jerk reaction that all coaches would do. "We would've won if not for our kids..." He has a point, but he's also missing the point. Bad tackling doesn't just happen. As Addazio mentioned in the preseason, this team is raw. It looks like they needed more tackling work. Murphy can be explosive, but he also seems to struggle in the pocket. He does other things really well. Maybe you shouldn't have him pass so often. Do more option. Or have him rollout or bootleg. If the WRs have the drops, put in other guys. I am oversimplifying, but so is Addazio when he says it is about execution. As for game management...there was one issue when we declined a penalty that might have pushed them out of FG range. The announcers mentioned it, but I agreed with Addazio. Why give them an extra down when we were happy to settle for 3 and get the ball back? I also don't love punting down 16, but we were still able to get back in the game. Good coaches lose winnable games sometimes. But now we need to regroup. Last year they made the most out of their talent. I think the talent level is close to last season, so it now becomes what can we do well. Addazio didn't do it against Pitt, but I have hope for the coming weeks. The bad news is that we allowed a 200-yard rusher. The good news is that was the first time a Don Brown defense allowed a 200-yard rusher at the FBS level. I went through his time at UConn and Maryland hoping to derive something from his time there. But no back every put up such numbers against his squads. Conner is a special runner, but the tackling was terrible as was some of the positioning. These issues are coachable. Let's hope the Head Dude figures it out. This game reminded me of the Georgia Tech loss in 2009 2008 [corrected]. It was early in the season and frustrating. After that game, the team regrouped. I hope this team can do the same. Pitt won but we didn't play well. There were plenty of missed opportunities on both sides of the ball. At this point I am more concerned about the defense. Murphy does enough well that we can build an offense around him. Addazio's tenure has been mostly high points. Now he's got to earn his money. This season could go either way. A good coach will keep the team fighting and competitive. I will have the second viewing thoughts and grades up Sunday. Pitt returns to the Heights. Fans return to the Heights. Students are back. It is the home opener, so let's make it a good one! Leave your thoughts and comments below. Entertaining myself this a.m. by providing Tyler Murphy highlights to my Gator friends. I'm thoughtful that way. It is Friday, so celebrate the end of the week with a little BC Football. Here are the clubs hosting Game Watches. If your local chapter is not included, post it in the comments section. I hate to put so much emphasis on one game, but this matchup could swing the whole season. If BC wins, it is a good measurement of where we are and also gets us 1/3 of the way to bowl eligibility. A loss would put this young team in a deep hole. If we cannot beat Pitt at home, where are the other five wins needed to be bowl eligible? This is a transition year with the bar set relatively low, but that still means winning a game or two against peer programs. I always think that Pitt should be better at football than they are. They have a better history than most programs and are in a better recruiting territory than most programs, yet they are never a consistent winner. They have high points, but then coaching changes disrupt the whole thing and they start again. Ultimately it has been good for BC that they have been mediocre for 30 years, but it is also raises a question. If Pitt cannot win National Championships or keep coaches around, will BC ever be able to reach our ultimate goal? 1. Explosive plays on offense. Addazio pounded this point home in the media, but it is fair. As boring as the offense might have seemed last year, we could at least count on a big play from Andre or a deep ball to Amidon. If we don't have a player or two who can turn a five yard run into a 50 yard run, our offense will get stagnant. 2. Keep Pitt under 150 yards rushing. I really liked our front seven against UMass. They did a good job controlling the line and tackling. Pitt ran all over Delaware and will try the same with us. The key will be winning the battle in the trenches. 3. No breakdowns in the secondary. I don't expect perfection, but we cannot have WRs running free. It cost us the shutout against UMass. In ACC play it could cost us a game. This is the second year of the ACC's new TV deal that mandates at least three Friday night games (one of which will be a BC game). This is our obligation this year. Last year it was against Wake. Given the contract, I assume that our game against Syracuse next year will be in the post-Thanksgiving slot. It couldn't have worked out better that USC takes on Stanford the week before our game. It will have their focus and they will be playing a team similar to us. Whatever happens, our coaches should have plenty of film to analyze and adjust our game plan accordingly. A decent turnout. The Groupon push has me worried that Alumni will feel empty. This is an important game and it would be nice to have the stands full. We can't get Pitt off the field. With both teams trying to run the ball, possession will be critical. If we cannot force a few three and outs, I fear that Pitt will control the game and limit our scoring. I think last week served as a good blueprint for this week. BC will run the ball well with Murphy leading the way. I think our Defense will slow Pitt down. We take an early lead and build on it. Pitt makes it interesting late, but can't do enough. I apologize for the tardiness of this post and the disjointed feel. I never had a chance to watch the game back uninterrupted and only just got around to finishing it Wednesday. Watching it back was much better than watching it live though. During the game, I kept worrying that our failed scoring opportunities would haunt us or that a mistake might be coming. The second viewing showed how much BC controlled the game. If we had been a little more aggressive, the game could have been over after the first quarter. Let me join in the chorus that praised Murphy. Watching the game back, it became even more clear that he's not going to be shaken. He had a good clock in his head on when to run or when to keep the ball. Even the option like play, he pitched at the last second. His one INT was a bad throw, but most of his passes were pretty good. Willis didn't look like Andre Williams, but he did the best job of shedding tackles. Rouse had some nice runs on the edge. I was glad to see Hillman get some touches. But as a group we do need bigger plays. Someone has to make a player miss and break a five yard gain into a 50 yard scoring run. The WRs weren't dynamic but they were effective. Crimmins showed solid hands. Bordner looked comfortable and made the most of being wide open on his TD catch. Phillips got his hand on a potential TD but couldn't pull it in. That would be a more crucial mistake against a better team. I worried about losing Williams, yet Kramer played very well in his absence. In fact, the unit didn't miss a beat. Gallik had a strong game and help open up many of the lanes in the middle. Silberman looked good. Betancourt had the biggest issues, but it wasn't poor play as much as it was penalties. When he wasn't getting called for something, he actually won many of his battles. It wasn't just Murphy that looked different. We were much more Oregon this week than Stanford. I liked the heavy motion of the end around (very Oregon). That will keep teams honest. I also like doing the bubble screen when the three WRs are clustered wide together. It is another Oregon staple, but we are doing it with basically three skinny Tight Ends. That will create mismatches going forward. Like so much of the game, this was a watered down version of what we might do this year. It worked well enough. The early drive killers were penalties, not bad calls. The Defensive line as a group looked very good. Wujciak wasn't credited with many tackles, but winning his battles and disrupting their runs. Mihalik was also very active and was able to get to the QB. If they control the line like they did against UMass, the D could surprise many people this season. We saw a healthy mix of rotations at LB. That's a good signal that we finally have depth. Duggan was fine. Keyes made the flashier plays and showed good speed on his delays. Daniels got plenty of time and look fine (though certainly not dominant as one blogger boldly predicted over the summer). The secondary looked like the weak link. There were a few situations where there seemed to be confusion between the Safeties and Corners about coverage. If UMass' passing had been more accurate, the Minutemen could have exploited more big plays (plenty of guys were open). Williams made a bone-headed late hit that kept a drive alive, but overall the tackling by the DBs was much better. Like the offense, this scheme was pretty vanilla. We rarely blitzed and played base personnel often. When UMass went four wide, we did counter with a nickel package. The few kick returns were solid. We didn't get to show much on the punts as the pinned us back. Howell punted well, but I am a bit worried about his field goals. The miss was close enough that he needs to make that in a tight game. The gameplan was solid. But I thought the best bit of coaching by Addazio was the halftime. Instead of getting frustrated with not converting the early drives into TDs, the team remained poised. You could see it in how he led them back on the field. And we kept running the ball without changing the gameplan. We used the timeouts well enough and at least attempted a two-minute drill. I didn't love the rotating kickers, but I understand why he did it. The main point of this game was not to screw it up. I found it encouraging, but we should know a lot more about the team after the Pitt game. I haven't had a guest blogger in a while, but felt the time was right to have Chas from Pitt Blather answer a few questions. Pitt is similar to BC in that they are building a run-based offense in a passing game sport. Unlike BC, they are now just getting used to life in the ACC and figuring out how good they can be under Paul Chryst. To get a better feel for what to expect, I asked Chas some questions. His answers are below. 1. The Delaware score put a scare into me. How much of that was FBS vs FCS and how much was Pitt finally being really good? Pitt Blather: I just am not sure. On the side of it being FBS v. FCS there's plenty of evidence. Delaware was picked for 6th in the CAA. They only had 2 players on the All-CAA preseason team -- a punter and tight end. And this is not Joe Flacco's Blue Hens. K.C. Keeler is not the head coach. Now it is Dave Brock. The kind of offensive guru that has been the OC for such luminaries in the coaching world as Kurt Flood (Rutgers, 2012), Ron Prince (K-State, 2008) and the immortal Bobby Wallace (Temple, 2002-04). Oh, and he also coached Tight Ends at BC from 2009-11 for Frank Spaziani. Dear god, I'm so glad I didn't know his resume before the Delaware game. There's no way I could have taken them seriously. That said, 62 points and 500+ yards of offense coupled with a shutout and keeping Delaware to less than 70 yards of offense is still something that goes beyond simply playing an overmatched team. 2. When he was a rumored candidate for the BC job at various points, the tag on Paul Chryst was that he was TOB-level boring in his game plans and persona. Now that you've got to know him, is that fair? Pitt Blather: Persona, there is more than a bit of white bread to him. Not in the grumpy joyless way Notorious TOB seemed to embody. Just, that he only wants to be a football coach and all the other stuff is just noise. Other members of the media swear he has a sneaky, dry sense of humor, but he doesn't really show that too often. As for his game plans, there is no question that he wants to do the Wisconsin thing. He wants the BIG offensive line. He wants to run the ball a lot. Not in dispute. But I'm hesitant to label it boring simply because it is more traditional. We had Dave Wannstedt putting his controls to the offense. I like to think we know boring offense, and this isn't it. There are more moving parts to it, and better executed. On defense, the emphasis is definitely more towards being more aggressive. I can't tell you the last time I saw Pitt execute a successful corner blitz, but they did it against Delaware. 3. Now that the ACC transition is over and the job is stable, what is the ceiling for Pitt Football? Pitt Blather: An open-ended question that doesn't have a fair answer. Within the next few years I believe Pitt will challenge for the Coastal (side question: how many years in the ACC does it take before you don't have to regularly double-check which conference you are in?). After that, it really depends on how things break. It isn't hard to believe that the way it is being constructed that Pitt can't become a regular 8-9 win team and have years where it does even better. Pitt Blather: Big surprise, I like Pitt to win this game in a bit of a grinder. I think Pitt's O-line allows for the running game to wear down BC's defense. While the Pitt defense does just enough to contain Tyler Murphy. Let's say a final score of 27-24 for Pitt.